After spending three sunny days at this year’s tournament, including a birdie-filled final round where Lexi Thompson fired a 65 en route to a one-shot victory, I can safely say there’s no “sophomore jinx” when it comes to the Meijer LPGA Classic. It was another resounding success. Permit me to share my grade book on the 2015 tournament. The Field: B+: Due to player injuries and the fact that this week is a major, the Women’s British Open, Grand Rapids this year lost such stellar names as Michelle Wie, Stacy Lewis, Lydia Ko, Suzann Patterson and Paula Creamer. And then on the eve of the tournament, defending champion Lee withdrew due to a wrist injury. Nonetheless, the field was still solid with such players as Inbee Park (no. 1 in the world), Thompson, Julie Inkster (Solheim Cup Captain), Christie Kerr, Anna Nordqvist, Morgan Pressel, Brittany Lincicome and the previous week’s winner, Chella Choi. In a twist of fate for a Tour known for its prominence of and dominance by foreign players, there were eight Americans among the top ten on the final Sunday leaderboard. Venue: A. Just like last year, Blythefield’s old school charm, parkland layout and pristine conditioning all received glowing comments. For both players and fans alike, the course is a comfortable walk with an entertaining variety of holes and settings. With ideal weather and firm fairways, the course played shorter than its listed 6414 yards especially for such a powerful hitter like Thompson. And thankfully there was nothing tricked up about Blythefield’s putting surfaces or pin positions. Like the PGA Tour, the LPGA knows that a course set-up conducive to making birdies and low scores adds entertainment value for the fans and viewing audience. In this regard, this year’s low scoring reminded me of the Buick Open days when birdies were made by the bushel at Warwick Hills. Improvements: A-. Last year, I felt the tournament fell short in providing public viewing decks on the closing holes. Instead, they were restricted to members and sponsors. This year, there were public grandstands on holes 17 and 18 and they were packed on Sunday afternoon. Last year, my colleague Jack Berry pointed out that the pairing sheets lacked the customary scorecard describing par and yardage for each hole. Presto! That was nicely fixed this year. Parking for fans also improved with a safer spectator entrance on Rogue River Drive while avoiding busy and dangerous Northland Drive. By the way, I’m only qualifying the grade with a minus because I want the tournament to keep improving! Golf Channel: B. In fairness, the tournament doesn’t really have much control over network television but then again the LPGA and the Golf Channel are “partners” in the business of televising tournament golf. Last year, I thought the TV coverage lacked a local flavor and perspective on Grand Rapids and West Michigan. There was no mention of Lake Michigan, Art Prize or even Grand Rapids’ national reputation for craft brews. Well, on Thursday’s telecast darn if the Golf Channel didn’t have a camera at Founders Brewing Company on Grandville Avenue. Well done! The playing coverage was typically sharp and on-course reporters Jerry Foltz and Jane Crafter know their stuff, the players and don’t miss a beat. Sorry, but I’m not a big fan of Tom Abbot and Karen Stupples whose British accents seem to be the overriding asset for them anchoring the telecast. Other Tournament Events: A. I’m at risk at being labeled a “homer” but tournament organizers, Meijer and Octagon, really went all out in successfully planning and executing a series of events: an upgraded Celebrity Pro-Am, Junior Clinics, a Celebrity Cookoff, a community concert with OneRepublic at VanAndel Arena, and even a 5K Run & Walk at Rockford High School. One local radio station touted all of the events as a good reason to take a “staycation” in Grand Rapids last week. Valid point. 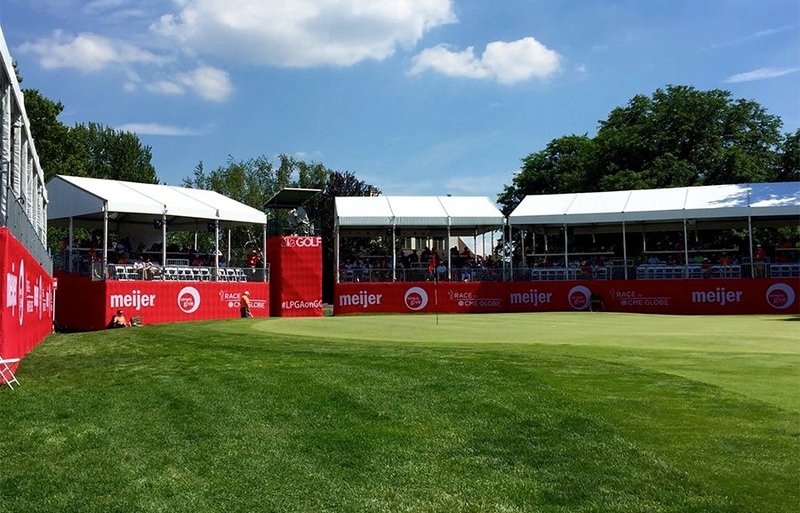 Charity: It’s not appropriate for me to grade a charity or even tournament donations on its behalf, but Meijer’s sizable $750,000 contribution toward the Simply Give program is indeed noteworthy and another sign of the tournament’s place in the community. The $750,000 donation will be divided among the retailer’s estimated 200 food pantry partners participating in the fall Simply Give campaign, which runs through Sept. 12. Speaking of food, it would be nice if the tournament offered more affordable concession items especially given the fact that the title sponsor is the leading grocer in Michigan. I don’t expect the Meijer LPGA Classic to match the Masters for providing less costly food and beverages for its “patrons” but it’s an area worthy of consideration. One family of four that I met spent on Sunday spent $39 for five hotdogs, a bag of chips and three drinks. To them, that seemed like stadium arena prices and not in keeping with a family-friendly mindset. So for that reason, I’m giving Concessions a B- grade in spite of the fact my spouse bought ice cream for only a dollar on Sunday. Next Year’s Date: The tournament dates for the next two years will be over the Father’s Day weekend, on June 13-19, 2016 and June 12-18, 2017. Although this means the tournament will be opposite the men’s U.S. Open, it shouldn’t have any impact on the gallery and West Michigan interest. These dates also avoid the conflict of being the week before an overseas major like the British Open this year when some notable players skipped Grand Rapids. My sources tell me the Meijer LPGA Classic will be part of a three tourney swing with KPMG Women’s PGA and Walmart championships next year. Fully expect as strong a field as last year. One other benefit of the new mid-June dates besides cooler temperatures: Blythefield members will get their course back, with shorter rough, earlier in the golf season. Class dismissed. Enjoy the rest of your summer vacation. Thanks, Lori. I was just pleased the public had viewing decks on 17 & 18 whereas last year there was none. Hopefully, the organizers will add even more public decks next year while also do a better job of informing its volunteers about “free admission” for kids.